The Master of Science and Doctoral Program Faculty of Economics and Business Universitas Gadjah Mada (MD FEB UGM) held the third series of six training modules in the Transferable Skills Training for Researcher. As the theme of the delivered module is “Development and Management of Research Projects”, the trainer in this third module is Professor Dr. Rosmimah Mohd Roslin from Arshad Job Graduate Business School, Universiti Teknologi MARA, Malaysia. This Training was held for five days from 25-29 March 2019 in the Lippo MD FEB UGM room with a full day system which is from 08.00-16.30 and the whole program uses English. The program is a partnership collaboration between the Research Performance at South East Asian Universities (REPESEA) supported by Erasmus+ through Capacity Building in Higher Education for assessment and research performance improvement for consortium members. For additional information, members of the REPESEA consortium are Indonesia, Malaysia and Thailand. 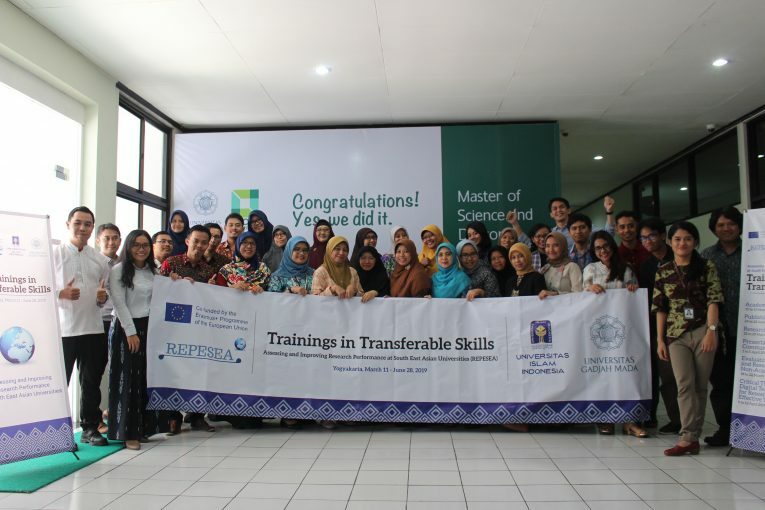 UGM, represented by the The Master of Science and Doctoral Program and the Indonesian Islamic University (UII), is a member of the REPESEA consortium in Indonesia which alternately hosts the training. A total of 40 participants from UGM and UII who were lecturers, doctoral students and master students attended training to gain valuable knowledge and experience. The third Transferable Skills Training for Researcher is intended to enable participants to build proposal projects that have good quality to be funded by donors. At the beginning of the session, Prof. Rosmimah provides training objectives that generally provide information for planning and writing successful research grant proposals. As well as obtaining resources to conduct research, budgeting, monitoring and management of research projects using lecture methods and practices. Successful proposals are able to communicate the potential significance of a research topic, inform about the impact of the research to be carried out, and ensure the feasibility of the research project. A well-written research proposal can also describe the purpose of a research proposal, by providing an overview of the relevance and objectives of a research project, as well as content, procedures and time, indicating whether the research project can be re-examined in terms of scope and time. During the training, the trainer divided participants into several groups as an exercise to plan, compile and write proposal grants to participate in the “New Zealand – Head of Embassy Fund: Calling for Proposals”. There are group presentation sessions and discussions by trainers regarding writing methods, language style, substance of the proposal, especially the discussion in determining the title and preparing the objectives of the grant proposal that are clear, focused, complex, and debatable. Prof. Rosmimah gives participants many tips such as criteria for good research questions consisting of five elements, namely feasible, interesting, novel, ethical and relevant. In addition, the criteria for ranking research priorities consist of appropriatenss, relevance, feasibility, impact of research results and opportunities to strengthen collaboration with partners. At the end of the training session after going on for 5 days, Nurul Indarti, Sivilekonom, Cand Merc., Ph.D, as Director of the Doctoral Program in Management FEB UGM closed the training activities. Nurul Indarti would like to thank all the participants and speakers who have attended the training. Finally, the training ended with a symbolic ceremony of giving certificates to representatives of UGM and UII, and also taking photos together.